NoCo Hemp Expo and going through NoCo5, we have been contemplating the past, cultivating the present and creating the FUTURE of hemp. As we roll into NoCo6, and 2019, the landscape for domestic hemp farming, processing, manufacturing, marketing and sales in the USA are going to change dramatically. 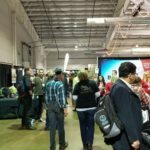 From legal and banking issues, compliance and supply chain management, product development, retail strategies, sales channels and consumer demand, the NoCo Hemp Expo Business Conference will feature dynamic guest speakers covering the most influential business topics to help start or refine your hemp company. Presented by Elixinol, you’ll hear firsthand success stories and take away key points in building infrastructure and opportunities to build a global hemp economy. Networking lunch included. Topics will range from regenerative-organic farming techniques, soil health and genetics, harvesting and processing innovations, new technology and equipment, updated regulations and compliance rules from the USDA, FDA, state departments of agriculture, other issuing authorities and more. Networking lunch included. Join Hemp Industry Daily at the NoCo Hemp Expo for this year’s Hemp Industry Daily Investor Forum. This one-day event will feature highly qualified investment professionals and business leaders covering the current hemp investment landscape, insights on investment trends and strategies, the global market, and evaluating hemp companies and opportunities. The Hemp Industry Daily Investor Forum at NoCo is open to accredited and institutional investors and small capital investors. Tickets for the Expo Hall, Investment Forum, Business Conference, and Farm Symposium will be available for purchase through our on-line ticket agency. Tickets will be also be available for purchase at the door. Conference and Symposium tickets are limited and may sell out before the day of the conference. Ticket prices will go up the day of the show.